With the revolutionary JBL Image Control Waveguide and refined transducers, JBL 3 Series MkII offers stunning detail, precise imaging, a wide sweet spot and impressive dynamic range that enhances the critical listening capabilities of any production space. 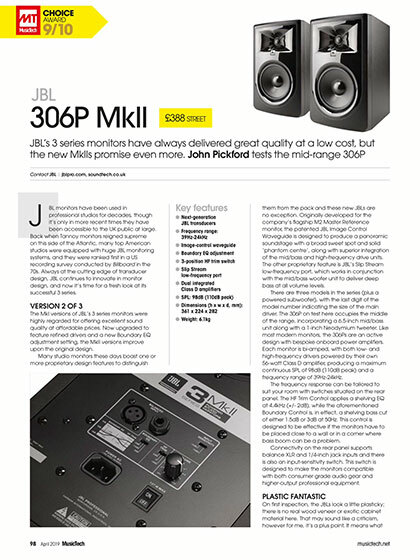 The 306P models feature a 6.5” woofer and are reviewed in MusicTech magazine, where they receive a 9 out of 10 rating and the magazine’s coveted ‘Choice’ award. "Placed on heavy concrete stands in free space away from rear and side walls, first impressions were not only positive, but also raised a few eyebrows. The sheer scale of sound, both In terms of perceived frequency range and soundstaging, completely belie the 306P's modest dimensions, so much so it would be easy to be fooled into thinking you were hearing our huge ATC SCM 1OOA main monitors." "It's also immediately clear that the Image Control Waveguide is playing an important part In the room-filling sound, as the stereo Image remains coherent without being focused into a tight central sweet spot." "In terms of scale, they sound far bigger than our NS10s and with their widescreen soundstaging, on a par with the larger SCM 25As. With that in mind, I would easily recommend the 306Ps as the sole monitoring system in modestly sized project studios." "Anyone looking for monitors in this range should ensure the JBL 306P Mklls are at the top of the audition list." The full review can be found in the April 2019 issue of MusicTech magazine on sale now. The JBL 306P MkII monitors are also available now priced at £239 RRP inc VAT (each). JBL Professional by HARMAN is distributed in the UK and ROI by Sound Technology Ltd. For more information please call 01462 480000 or visit https://www.soundtech.co.uk/music-retail/jbl.